1. 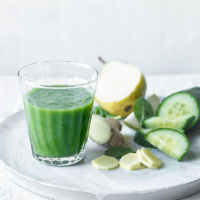 Put all the ingredients in a powerful blender with 50ml chilled water and blend until smooth. Divide between 2 glasses and serve immediately.